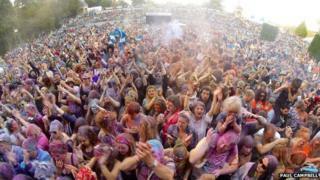 Thousands of fans who attended the Belladrum Tartan Heart Festival near Beauly have been praised by the police. Three people were arrested during the two-day festival. Police Scotland said there had been a small number of drug seizures. The Tartan Heart Festival was headlined by Sir Tom Jones and Scots band Frightened Rabbit on Friday. The festival, now in its 11th year, closed on Saturday with a set by Indie band Razorlight. Officers dealt with five reports of missing children on the first day, all of whom were quickly re-united with their parents or other relatives. A 33-year-old man was arrested on Friday for breach of the peace. There were two furthers arrests on Saturday, one for breach of the peace, the other for assault. Event commander, Chief Insp Mark Mackay, said the general standard of behaviour was "very good". He said: "It has been an excellent event with very low levels of disorder and crime and we thank everyone who attended for their friendly approach and good nature. "To ensure it ends in the same way and everyone gets home today safely, we stress to drivers to ensure they are sober and fit to drive before leaving the festival." He added, "Given the volume of traffic leaving Belladrum there will be delays in the surrounding area especially the Beauly to Inverness road so we ask everyone to be patient and take your time. "Traffic will be managed away from the site and traffic officers will be patrolling roads in the area." Held in the grounds of a Highland estate, the event sold out five months before it was to take place. The cancellation of this year's RockNess also left it as the biggest music event in the Highlands.